Welcome to Toy Academy: where toys learn to play. This is where action figures train to battle; stuffed animals study the art of the hug, and collectibles practice standing very, very still. Grumbolt isn't really any of those things. Lopsided and handmade, he doesn't know what he is or where he belongs! But when the Evil Toy Academy threatens to bring down his school, it's up to Grumbolt to go where no good toy has gone before and prove he's truly a great toy after all. In the junk shop at the end of the street is a dusty old ship in a bottle. And when the world isn’t watching, a tiny pirate crew comes out of the ship to explore. They aren’t much bigger than a matchstick, but they have a HUGE appetite for adventure! 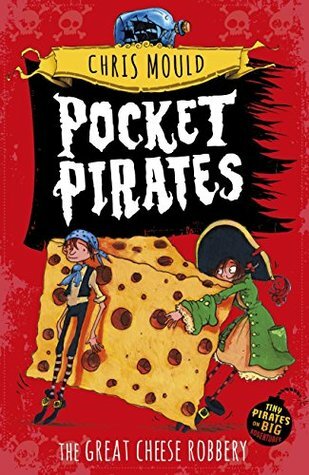 When a band of mice kidnaps Jones, the ship’s cat, and ransoms him for cheese, the Pocket Pirates spring into action. But to get the cheese, they must venture to the freezing cold place where it’s always winter…the place called Fridge. Can the Pocket Pirates survive their perilous journey and get their ship’s cat back? In this series opener, Koko Dodo the cookie chef has a big problem. Today is the day of the royal cookie contest, and someone has stolen his top-secret fudge sauce! Luckily, a spy enters the scene just in time (or rather, crashes in on her roller skates): Didi Dodo! This might be Didi’s first case ever, but she has a daring plan to help Koko. Koko would prefer a safe, simple, sure-to-work plan, but without another option, he and the amateur sleuth take off on a wacky caper full of high-speed chases and big belly laughs that could only come from the mind of the inimitable Tom Angleberger. Jake Everdale is about to flunk science class and his mom is threatening to pull him off the baseball team. Can the season be saved? When Jake makes a desperate wish for homework help, he can't believe what happens next -- his Heroes of History action figures come to life! Famed scientist Sir Isaac Newton and legendary pilot Amelia Earhart are going to make sure Jake aces the science fair. But these tiny geniuses have minds of their own! Mr. Popli, the mouse Mayor of Garbage Island, is always at odds with Archibald Shrew, a brilliant but reckless inventor. When Garbage Island splits apart, they're trapped together in Mr. Popli's houseboat, desperate to find their way home. At first, they only argue, but when they face a perilous thunderstorm and a series of predators, they begin to work together and recognize--in themselves and in each other--strengths they didn't know they had. Nonstop action and deep emotion intertwine in this tale of opposites who discover that with bravery, creativity, and friendship, they can triumph.